They specialize in throwback prints and light up marquee letters. On first glance you may think their wares are vintage finds but in fact, that's just the inspiration. Luke makes everything himelf. As he states, "Everything I make is carefully aged and expertly wired, made from fine art canvas or salvage wood and bent steel, speed rusted and banged up proper." I really love this idea and his prices are great for the meticulous effort he puts into making these. 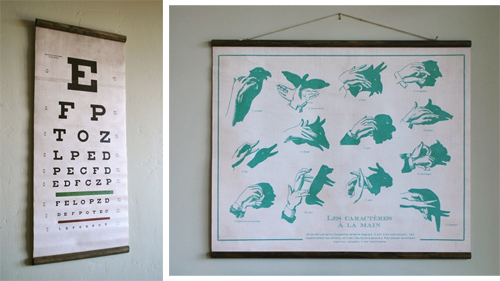 The Eye Exam print it $90 and the Hand Shadow Puppet print is $140. Either would look amazing in a kid's room. The great thing is Luke can customize any type of letters you're looking for- with choices on wood and color. I like the idea of a simple word like MILK above the fridge. It' a quick way to add one of a kind style and flair. The Twin Brothers print is a 1950's reproduction that I love as a gift idea for a guy's office (who happens to be a twin)... and it's hard not to love the museum regulation sign. As Luke says, "For hosting those raised in a barn, it may oddly come in handy." We've all seen growth charts in people's homes but I've never seen one quite like this. It's 100% accurate to the measure, made of sturdy canvas and "hung with banged up wooden rods on the top and bottom, giving them the old school room finish." I love, I love... See all of Sideshow's fabulous creations here.